New Hitchhiker's Guide to the Galaxy material found! 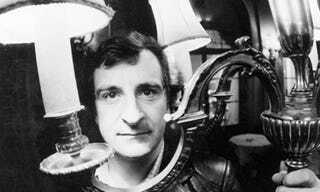 Going through Douglas Adams papers, friends and family discovered unused Hitchhiker's drafts no one knew existed! They were probably the bottom of a locked filing cabinet stuck in a disused lavatory with a sign on the door saying "Beware of the Leopard." Apparently since Adams was such a well-known technophile, everyone assumed all his new work was stored digitally - and much of it was - but it seems some of his unused (or possibly in-progress?) writing was only in hardcopy. And now it'll finally see print as part of an upcoming biography, appropriately titled The Frood. Holy Zarquon's Singing Fish, this has me excited.